Via Weer'd comes this video of some 'Gentlemen' saying what they really think about firearms, firearm owners and the NRA. Even outside of the lack of knowledge of firearms or the shooting culture, just listen to the sneering, smarmy, holier-than-thou attitude they exude as they tell you how stupid and uncultured you are for daring to enjoy or own something they disagree with. This is the kind of video we need to spread far and wide to firearm owners to remind them what is really on the minds of gun control advocates when they talk about 'safety and common-sense'. Think 'gun control' isn't above using a tragedy to promote their political agenda? And the 'tribute' site set up by lefty group 'ProgressOhio'? They 'need' tragedies like school and movie shootings to even try and push their agenda even though most of these kinds of events occur in places where all their 'common-sense' laws are in place (ie 'Gun Free' Zones). Remember that next time you hear one of them try and blame the NRA or gun owners. 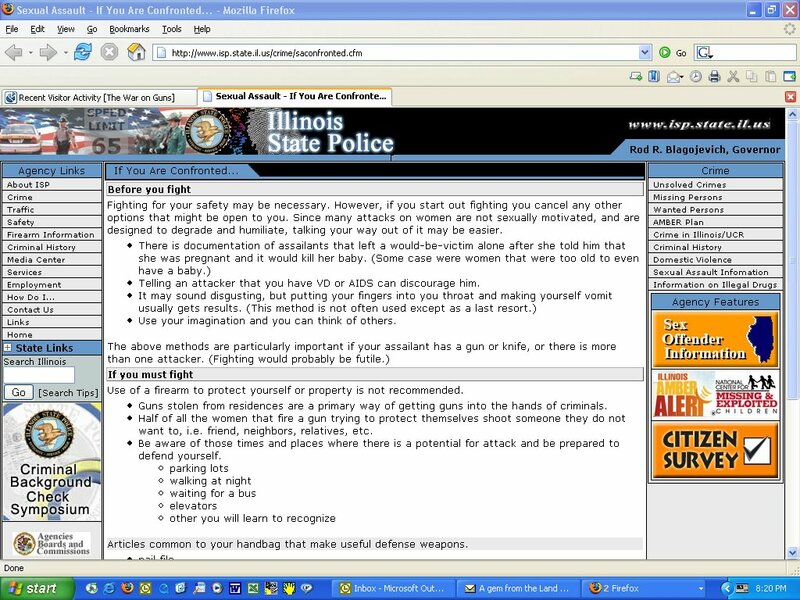 In Illinois, the ISP advised women who were being attacked to make themselves vomit because "Fighting would probably be futile". In Texas, the City of Houston put up an informational video on how improvise weapons in order to attack an assailant. Which state do you think really cares about protecting citizens and reducing crime? Stealing Weer'd's meme. I for one have regularly heard the talking point from anti's "If he hadn't had a gun, he couldn't have killed that many people." So yes, even outside of using fire or explosives, mass murder is entirely possible without firearms. John Rosenthal, head of.... well no group anymore, imparts this bit of wisdom. "But outside of Massachusetts and other progressive pockets, 33 states, including Maine, New Hampshire and Vermont make guns readily available from private dealers without ID or background checks. Not only do these states have remarkably higher firearm fatality rates, but they undermine stricter, more responsible laws in bordering states"
So again proving that even if John says is true, it just shows that anti-gun advocates don't really care about reducing deaths, just guns. Gov Quinn rewrote a pro-gun bill on mail order ammo to add an AWB. I am a strong supporter of the Second Amendment of the United States Constitution– the right to bear arms. There is no place in the State of Illinois for weapons designed to rapidly fire at human targets at close range. The ban would not pertain to law enforcement officials or members of the military. So according to Quinn, it's perfectly acceptable for police or military to fire rapidly at human targets at close range. Another POS politician who needs to be run out of office. Within 48 hours of the terrible tragedy in Aurora, Colorado, (before the facts were known besides a gun was used), a new campaign fundraiser was launched called We Are Better Than This. It was based on the fundamental belief that we are better than a nation with mass shootings like the one in Aurora, Colorado, and better than the 32 gun murders that happen every day. desperately short of money and need to take advantage of opportunities like this to keep what little staff/influence we have left. I've done more shooting in the past week than I've done all summer. Taking my niece out a few days ago, friends over yesterday and today, and my mom will becoming down in a few day and getting her 'annual training'. I need a lot of refresher but I'm not entirely rusted up. Sat. had some friends over to shoot. The camera crapped out right when we were getting started so I just did a group shot when we got back and I could replace the batteries. The lady in the middle was a new shooter. She didn't enjoy it as much as Joe's outing w/ his DIL but she didn't hate it. Today another friend came over for some shooting and gaming. The wife decided to come out for some range time as well. Neither of us were able to hit crap w/ it. Then I took a close look at the forward sight. THAT explains it. Not entirely my fault. Well that means sometime over the next week or so I'm going to have to do some zeroing.